Yeung Family Tai Chi (The Hong Kong Yeung Family Kung Fu system). Yang style Tai Chi comes to us from the Yeung (Yang) Family. Yang is pinyin Romanised for the Mandarin pronunciation and Yeung comes from the Cantonese as spoken in Hong Kong. A similar concept would be the official pinyin term for Tai Chi is Tai Ji, however in the West most people spell the art Tai Chi. 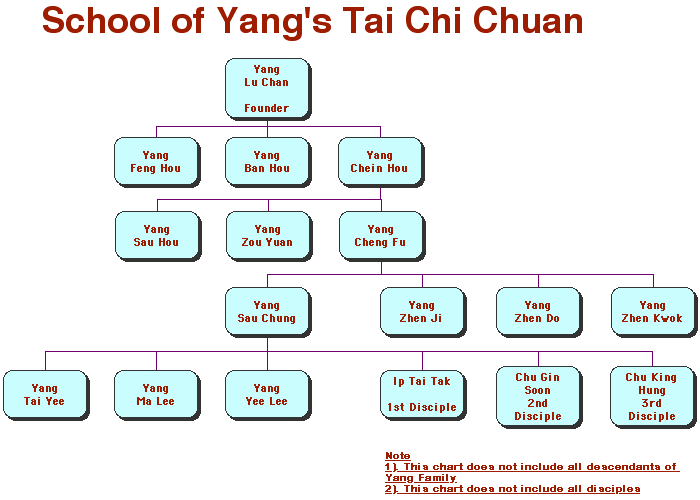 The Yang (Yeung) Family have sought to uphold the principles and train themselves and others to the highest degree. Through their efforts and those of their disciples, Tai Chi has become very popular. Indeed it is considered by many to be a National Treasure of China and our opportunity to tread the path or Tao provides a chance to glimpse at Chinese philosophy in action. As we participate, we can experience the benefits for ourselves. Irrespective of ability, Tai Chi appears to teach each and everyone of us lessons that we should learn and apply in our lives. Generation by generation the Yang Family have continued to study and share this extraordinary Martial Art. As a direct result of this process, Yang Chen Fu and his son Yeung Sau Chung traveled extensively encouraging and empowering fellow countrymen to learn. Yeung Sau Chung moved to Hong Kong in 1949 where he continued his work. Tai Chi Chuan was introduced into the West during the last century by the disciples they taught. 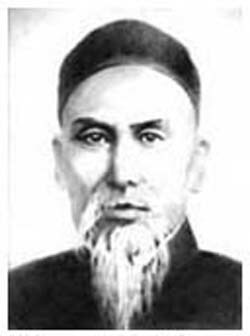 Yeung Sau Chung, eldest son of Yeung Cheng Fu, stated that he taught his daughters very well. His three daughters are actively involved in following their fore fathers footsteps, working towards greater worldwide understanding of the family's art. They continue to work tirelessly in sharing and educating people in this ancient Art. This has recently culminated in the creation of the Yeung Ma Lee Student Association. Keith Robertson of Mountain River Tai Chi is one of very few people to have trained with all three of Yeung Sau Chung’s disciples and through the YMLSA is receiving direct input from the Yeung (Yang) family in Hong Kong. Originally famous foremost as an excellent fighting system, Tai Chi has become, over the last century, very popular as just a healthy exercise regime. Tai Chi Chuan has been translated as the Supreme Ultimate Fist. Perhaps this seems far fetched for what most people have seen of Tai Chi is only it’s slow motion movements. However throughout China, Yang family members were known for there fighting prowess by the title Unbeatable Yang.